Studies and Texts 189. 2014. xvi, 260 pp. The eleventh to the thirteenth centuries saw the growth of a number of movements seeking monastic reform. The Caulites, or Valliscaulians, named for the site of their first monastery in northwest Burgundy, were innovators in monastic practice. They expanded throughout a broad region in western Europe, and counted among their benefactors some of the most important noble families of their day. The order lasted almost six centuries, yet remains obscure in the historiography of medieval monasticism. Medieval monasticism was not uniform and monolithic. Even after the ninth-century adoption of the Rule of Benedict as the standard for most monasteries throughout the Carolingian Empire, there was wide variation in its practice. The eleventh to the thirteenth centuries, a time of especially great religious ferment, saw the growth of a number of movements seeking to reform monastic practice, to make it more ascetic, more “true” to the Regula Benedicti. In the early thirteenth century, the Franciscan and Dominican Friars were the agents of reform, and many historians see the Friars as a watershed in the history of religious life in the Middle Ages. Yet when Francis of Assisi was only eleven years old, before the creation of the Franciscan life was barely an idea, monasticism in Burgundy experienced another reform. This was the foundation of the Caulite Order. The Caulites founded their first monastery in 1193, roughly a century after the advent of the Cistercians, barely two decades before the advent of the Franciscans. The order, also referred to as the Valliscaulians, was named for the site of this first monastery in Val-des-Choux or “valley of cabbages,” located in the Châtillon forest, some twelve kilometers southeast of the town of Châtillon-sur-Seine in northwest Burgundy. The most important benefactor of the order was Odo III, duke of Burgundy. The order’s spiritual founder was a certain Viard, sometimes called Guy or Guido, who, according to eighteenth-century mémoires of the order, was a former Carthusian lay brother. The Caulite Order received papal approval in 1205. It expanded in the first half of the thirteenth century, growing to some seventeen houses in France (mostly Burgundy), three in Scotland, one in what is today the Netherlands – some historians have even suggested Spain and Portugal – and founding its last monastery in 1267. The order lasted almost six centuries, but reduced numbers (both of monks and properties) forced the Caulites in 1764 to unite with, and be governed by, the Cistercian abbey of Sept-Fons, in the Bourbonnais region of France. They experienced a brief revival in the late eighteenth century, but then disappeared in the wake of the French Revolution. 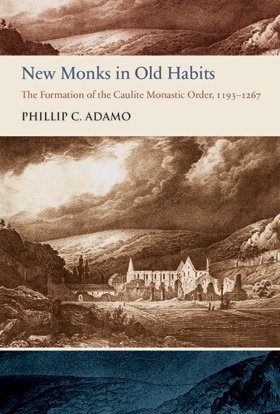 The Caulites were innovators in monastic practice: they expanded throughout a broad region in western Europe, and counted among their benefactors some of the most important noble families of their day. Yet they remain obscure in the historiography of medieval monasticism. It is time for this state of affairs to change. Phillip C. Adamo received his doctorate from The Ohio State University, and is currently Associate Professor in the Department of History and Director of Medieval Studies at Augsburg College, Minneapolis. Much recognized as an inspiring teacher, he was presented with a CARA Award for Excellence in Teaching by the Medieval Academy of America in 2014. The author of articles in Cîteaux: Commentarii cistercienses and Revue Mabillon, as well as essays in a number of reference works, he collaborated with Joseph H. Lynch on the second edition of The Medieval Church: A Brief History (2013).